This article will be a summary and commentary on the papers The First Property Rights Revolution supplemented by information from the article Coevolution of farming and private property during the early Holocene. Common ownership can emerge from a Hobbesian state of nature and be a stable regime if it has collective enforcement of non-sharers and non-punishers. It can’t be invaded by predatory strategies. Also it can’t be invaded by the property strategy when ownership can’t be clearly signalled. Once property can be clearly demarcated individual ownership can easily replace common ownership. Clear definition of ownership is crucial to the success of the property strategy. Ambiguous ownership results in increased conflict. No central authority or collective enforcement is needed for property to be successful. Property emerged before the formation of states or other central authorities. Agriculture could not have emerged without norms respecting individual ownership of property. Norms respecting individual ownership of property could not have been wide-spread without agriculture. The technology of agriculture and the culture of individual ownership of land emerged together and were dependent on each other. In a previous article (The Property Strategy) I showed how property is a successful strategy for reducing conflict of scarce resources and wins out over, sharing or fighting over, contended resources. Yet, we know that early humans lived in egalitarian hunter-gatherer bands for at least 100,000 years. If private property is so successful how could the common ownership observed in hunter gatherers persist so long? And what caused the transition to private property? Empirically we can observe animals exhibiting the same behaviour as property. See the article Property is Not Just a Social Construct. If primitive animals like butterflies can utilize property to reduce conflict why didn’t humans adopt private property in land earlier. Was it because the state is necessary to establish property rights, and it had not formed yet? Samuel Bowles and Jung-Kyoo Choi explain in their papers The First Property Rights Revolution and Coevolution of farming and private property during the early Holocene the transition from hunter-gathering to agriculture was accompanied by a transition from common to individual ownership property. Bowles & Choi point out, the archaeological record does not leave direct evidence of property rights, however a transition from common to household or individual based food storage systems give indirect evidence of private ownership. For example, in the Levant between 14,500 and 8,700 B.P. the emergence of agriculture coincided with the emergence of dedicated storage located inside dwellings, suggesting private ownership of produce. Also there are some cases of well-defined individual property rights emerging before domestication, in fisheries for example. Some evidence that individual ownership norms were necessary for farming, can be seen in the conflicts between farmer and foragers that have been observed in contemporary primitive tribes. ‘The traditional Batek notions that all natural resources are unowned until collected and that any food obtained in excess of the needs of the procurer’s family must be shared with other families seem well suited to a nomadic foraging life, but wholly unsuited to … farming’. The two Batek men who had discovered cultivated rice tried planting some. However, their fellow group members simply harvested it (and, of course, felt obliged to share the harvest with the entire group). In the paper The First Property Rights Revolution, Bowles and Choi created a game theory model to simulate hunter and gatherer societies. It starts as a modified war of attrition (Hawk-Dove game) as I described in The Property Strategy, but with three strategies instead of two: Graber (Hawk), Sharer (Dove), and a new strategy, Punisher or Civic (The First Property Rights Revolution uses the term Punisher and the Coevolution of farming and private property during the early Holocene of uses the term Civic for the same strategy). The Graber and Sharer act just like Hawks and Doves respectively in the Hawk and Dove game. Punishers act like Doves, except when a Punisher interacts with a Graber, all the Punishers in the community attempt to punish the Grabber for not sharing. The triangle below shows the possible distributions between the three strategies. The top point is all Punishers and the lower left point is all Sharers and the lower right point is all Grabbers. The area between the points represents all the other possible mixtures of strategies in the population. For example if we move from the all Sharer corner towards the Grabber corner this represents Grabbers invading the population and becoming more numerous and the Sharers becoming less numerous in the population. In this model there are two equilibria, one that is dominated by Sharers and Punishers and one that is dominated by Grabbers. Bowles and Choi call the Sharer-Punisher equilibrium the Rousseauian equilibrium and the Grabber equilibrium the Hobbesian equilibrium. 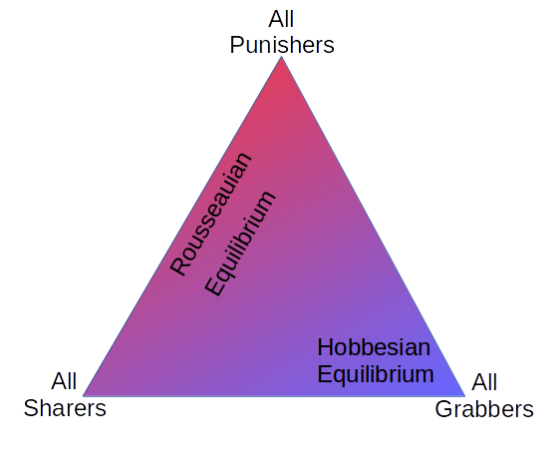 The Hobbesian equilibrium is quite stable while the Rousseauian equilibrium is not as it can drift toward more Sharers and then be invaded by Grabbers. If the Rousseauian equilibrium is not stable why do we see common ownership in hunter gatherers? Conformist culture passed down to each generation. Collective punishment including punishment of non-punishers. Once these are introduced into the model, the Rousseauian equilibrium becomes stable and not easily invaded by Grabbers. This is because the Punishers discourage both the Grabbers and the Sharers that shirk the punishment role, within the community, reducing the overall conflict and allowing the community to be more fit than groups made up of mostly Grabbers. Groups of mostly Grabbers are then more likely to lose in conflicts with groups that have more Punishers. This seems to model how egalitarian hunter-gatherer tribes could remain in the Rousseauian equilibrium. Around 11,000 years ago the climate stabilized and agriculture begins to emerge. Rousseau is accusing the first farmer that tried to keep people from trampling or stealing his crops, for being the genesis of many of the conflicts of the world. Yet it was this struggling farmer protecting his crops that initiated a reduction in conflict that allowed a more peaceful and productive world. With the advent of cultivated land, it was much easier to define ownership over crops and crop-land than is was with wild game. With clearly defined ownership the Bourgeois strategy can be successful, as it is in a standard Hawk and Dove game. See the Property strategy. Now when Bowles and Choi add Bourgeois to the model they put in place of Grabbers. They can then easily change the ambiguity of property rights to switch between Bourgeois and Grabber. This is because Bourgeois acts like a Grabber when property rights are always mistaken, since Bourgeois will always fight to defend what they think they own. Also Bourgeois will do better than Grabber as long as property rights are at least sometimes correctly identified, so eliminating the Grabbers from the simulation won’t change the outcome. So for simplicity, Bowles and Choi eliminate the Grabbers from the simulation and replace them with Bourgeois. Once property rights are clearly defined the Bourgeois Equilibrium becomes the only Equilibrium, and none of the other strategies can invade the Bourgeois Equilibrium. 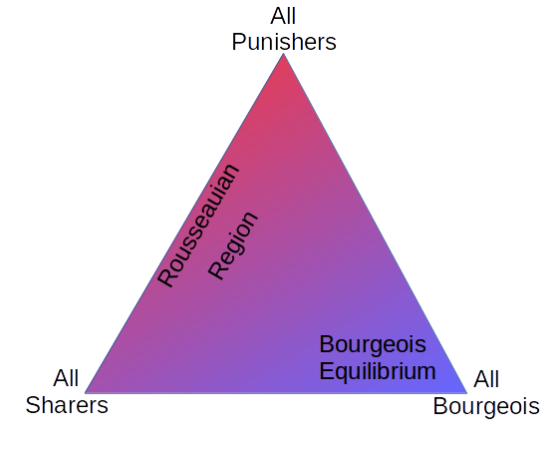 This model shows that even with the conditions that support the Rousseauian equilibrium, once property is clearly defined the Rousseauian regime collapses and the Bourgeois (Property) Strategy wins. In this model property rights are respected and defended without central enforcement like a state, and without collective enforcement, as is needed for the Rousseauian equilibrium. It is successful in spite of group competition like wars since groups that respect property tend to be more fit and more likely to win inter-group conflicts. Individual property rights had difficulty emerging before agriculture, since it was hard to clearly identify ownership. Once ownership was easily signaled through clearly visible improvements to the land needed for agriculture, then individual property rights could be established. Game theory can’t tell us what happened in the past but it can tell us how it might have happened. This model explains how humans could have left the Hobbesian state of nature into a Rousseauian state of communism then to the adoption of Bourgeois property norms of individual ownership. This model corresponds with the available empirical evidence. In your blog you always discuss my favourite aspects of Libertarianism, I really apprecitae this article especially. Keep up the good work, this is marvelous! Excellent. I had no idea that this sort of work was being done. Thanks for bringing it to my attention.